Want to paint a concrete garage floor? It’s a relatively easy and inexpensive project. A smooth coat of color makes the garage look great. Concrete paint comes in both latex and epoxy formulas. One-part epoxy paint is a good choice because it resists mold, mildew and stains. Epoxy-based paint tends to last longer than latex paint because it makes a strong bond with the floor. Why Paint a Concrete Garage Floor? Bare concrete releases dust as it wears out. Paint seals the surface of the concrete. A painted floor keeps the garage, and everything in it, cleaner. When dust settles on garage door electronic eyes and in the tracks, it causes trouble. Dirty tracks can bog down the movement of the door. Dust-covered safety eyes keep the automatic door opener from working. Keeping the components of your garage door clean and maintained helps avoid the need for garage door repairs. Clean: Wipe up oil spills. 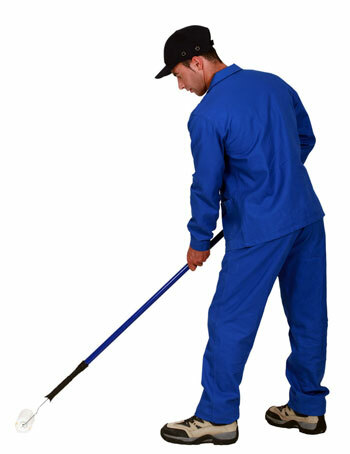 Remove loose debris by sweeping or vacuuming. If dirts remains, work on it with a pressure washer. After cleaning, allow the floor to dry. Repair: Fix small holes and cracks with a patch product designed for concrete. Texturize: A smooth floor won’t hold paint as well as one that has texture. An etching product will add roughness to concrete. Products are available that both clean and etch concrete. Primer: Some paint labels recommend applying a concrete primer to help with bonding. Concrete usually requires two coats for an even coverage. After the first coat dries for several hours, assess if a second coat is needed. In general, paint a concrete garage floor when the surface temperature of the floor is between 50-90 degrees Fahrenheit. Follow the instructions that come with your paint. Apply a first coat. Paint the edges of the floor using a nylon bristle brush. Use a roller to apply a thin, even layer of paint. Work in one direction using long strokes. Apply the second coat. Allow the first coat to dry for at least four hours or as specified on the label. Apply the second coat in a crosswise direction from the first coat. Allow the paint to cure. The paint will feel dry within a few hours, but it won’t be ready for foot traffic for a day or two. Wait at least 24 hours before walking on the paint. A full week of curing may be required before it’s safe to park your car in the garage. Ponderosa Garage Doors installs beautiful, functional doors. If you’re remodeling your garage, don’t stop at the floor. Consider upgrading to a new garage door. Contact us for an estimate.